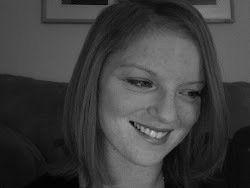 Those Last 75 Pounds: DIY! I don't know about your race bibs and medals but my race bibs and medals have been living in multiple places. Piled in the junk drawer . . . stuffed in a cubby box . . . and most recently, stuffed into my last Nike shoebox. 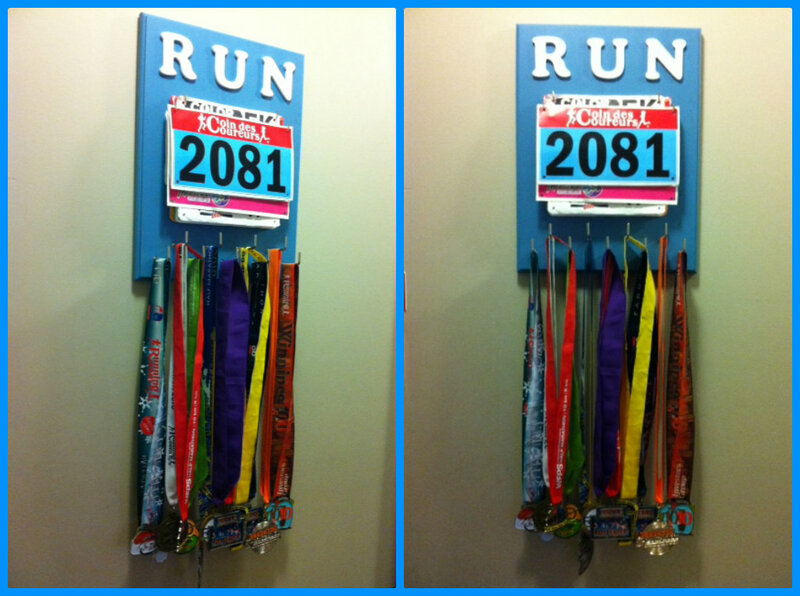 A couple months ago, I was staring at my pile of bibs and medals trying to think of a way to store/display them. I figured lots of people had the same system that I did but somebody out there must have a better way. Enter Google. Turns out there is lots of ways to store them! But my favourite way, was a wooden plaque I found on Etsy. The price was anywhere from $35 to $55+. Gulp. Plus shipping. I left it at that. I was going on vacation and would revisit it when I got back. I thought about it and decided to get it because what else would I do. Entered my order, all ready to spend $50 and then I see that they don't ship to Canada. Well crap. Kept looking for a place that would and then thought, wait, how hard can this be?? Turns out? Not hard at all. Last night, I painted it. This morning I glued the letters on and put the hooks in and VOILA!! I bought a 12 x 16 unfinished pine plaque with a fancy bevelled edge from Michael's. Michael's is a bit pricy so the regular price was $25 but they put coupons on their flyers so I had a 50% off one. I bought the already white painted letters from there too at $1.69 each. I had leftover blue paint from my bedroom and I bought square shoulder hooks in two sizes from, about $6 but I have so many in the packages, I could easily make some plaques for friends who have already expressed interest them. So for about $23, I made myself a display that I LOVE!! It was really quick too. The part that took the longest was measuring where to put the medal hooks so they were an equal distance apart. :) I could have bought a cheaper plaque that was 11 x 14 but that would have been a little snug. If you'd like to make it cheaper, you could cut a piece wood yourself! What a great idea! I think mine from back in the day have probably been thrown away by now. Having them now would be such an inspiration! That is AWESOME! I don't have any medals (yet) but I was saving my bibs for a while....I recently started a running scrapbook....basically just a scrapbook of my runs...and of course bibs go in there on those pages along with memories and commemoration of PR's and such. But I'm SOOOO doing your idea if/when I run races that net me medals! At the etsy site, they had some where the bib plaque and the medal plaque were separate pieces. You could always make one for bibs only and then do that. 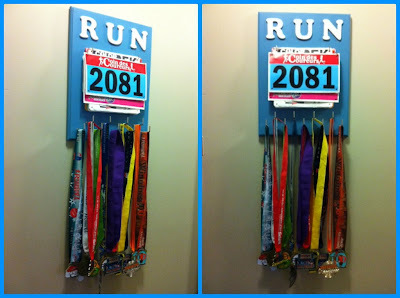 Or you could just wait till you have a medal before you put medal hooks on. I just love it so much.